See also: Furniture; International Home Furnishings Market. High Point, in southwest Guilford County, is a center of the wood furniture industry in the United States. The city was founded after the legislature in 1849 approved construction of a plank road from Fayetteville to Salem and a railroad from Goldsboro to Charlotte. The community that developed where the road crossed the rails took its name from the fact that it was the highest point on the rail line. The town was incorporated in 1859, and the first furniture factory opened in 1888. Within 50 years, High Point was home to 160 companies, half of which produced furniture or woodwork. The first furniture exposition in North Carolina was held in 1905 at High Point, and construction of the Southern Furniture Exposition Building in 1921 allowed High Point to replace Chicago as the site of the nation's most important annual furniture show. The 1920s became the town's first boom era. High Point's population swelled from 14,302 to 36,745 over the decade, while almost $20 million in building permits were issued and more than $26 million was spent on city improvements. The 1950s brought the second boom. The population grew from 39,973 in 1950 to 62,063 in 1960. The furniture industry set the pace, but there was also strong development in textile manufacturing. Growth of the "furniture market," as it is called, mirrored that of the city itself after the 1950s. In 2005 High Point, with a population of about 100,000, was the eighth-largest city in North Carolina. High Point Chamber of Commerce, The Building and the Builders of a City (1947). Roy J. Shipman, High Point: A Pictorial History (1983). Search results for High Point > High Point (Guilford County, N.c.). From the North Carolina Digital Collection, NC Department of Cultural Resources. 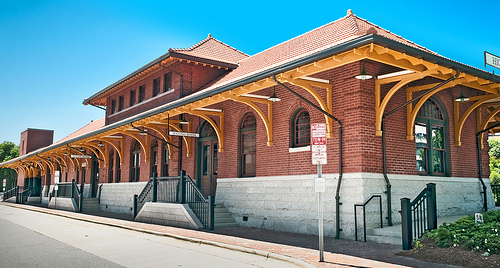 "High Point Train Depot (1907), 100 West High Avenue, High Point, North Carolina." May 20, 2009. Available from: Flickr Commons user Steve Minor, http://www.flickr.com/photos/sminor/3865066800/ (accessed December 3, 2012).